Accuracy: Please ensure to double-check the information at the bottom of the Active confirmation email for accuracy as these are the details which will determine your race class. Those who have failed to advise us of any changes will be eliminated from the prize categories. Complete: If you have not yet completed your entry contact the office at your earliest convenience. Incomplete entries will not be allowed to race. Changes: If you need to change anything to your entry, please let us know asap. The registration system does not allow participants to make changes themselves so all changes have to be emailed through to admin(@)oceantocity.com. Be particularly aware of any changes that might alter your racing class (e.g. age, crew gender, boat types). All boat types will be verified before launch and late changes to crews, craft etc. must be recorded before the race. 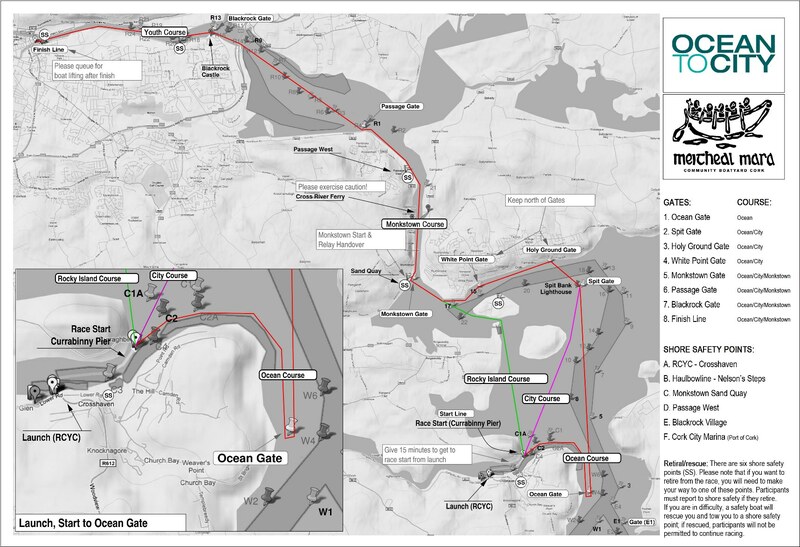 Ocean & City Courses: Registration will first open on the Friday before the race from 16:00 – 20:00 at the RCYC in Crosshaven. Because of the early start on Saturday, we encourage anyone who can register and collect their race pack on Friday, to do so. On Saturday morning we will open registration 7:00-9:00 at the RCYC. A mandatory Participant Safety Briefing will also be given at 8:45. Your race pack will contain: Course map & instructions, launch & recovery information, orange flag, regulations and general information. Monkstown Course: Participants starting from Monkstown have to register at the Monkstown slip, between 9:15-10:30, on the Saturday of the race. A mandatory Participant Safety Briefing will also be given there before the race. This means that it is not needed for Monkstown participants to travel to Crosshaven. Please note that it is your responsibility to advise us of any changes in your entry. Those who have failed to advise us of any changes may be eliminated from the prize categories. Monkstown: please note that this is a public slip without secured boat storage. We advise participants to not leave their boats unattended. Cork city parking area to be confirmed closer to race day. Launch: Crews are welcome to launch their boats at the big slip in front of the Dinghy Hut in the RCYC from Friday morning onwards. Note: There is no crane available at the start. The big slip facilitates enough space to launch from your trailer. Our Launch Coordinator will be present from 16:00-21:00 in case of any questions. Recovery: At the finish line our team of volunteers will be working hard to get every boat recovered as fast as possible. With over 200 boats to recover, we would ask for your patience as there is also a GAA match happening in the area and we expect traffic delays. Our volunteers will endeavour to get your boats recovered as quickly as possible. Boats will be recovered by the Doyle’s Shipping crane. Kayaks will be recovered from the Port of Cork Marina and must be collected from North Custom House Quay (strictly pick up only). Either at your accommodation or at a location to be confirmed closer to race day. Please note that there is no parking at the Port of Cork. Park your trailer overnight in the Cork city parking area (which is to be confirmed). You can then avail of the Crew Bus on Saturday morning (details below). To Crosshaven: Special Crew Buses will be organised to run from Cork’s Albert Quay to the RCYC in Crosshaven on race day for those who have already left their boats at the start. This bus will leave 7:30 and arrive in time for the mandatory Safety Briefing. Tickets cost €5 pp and need to be purchased through the Active registration system upon registering (available under additional purchases). There will be a mandatory and detailed safety and course briefing before the race start. A member of every crew (captain or cox) must attend this Safety Briefing and a sign-in sheet will record signatures. Crews who have not attended the Safety Briefing will not be permitted to launch or race. The provisional first start time from Crosshaven is 10:30. Boats will start to arrive at the finish line around 12:30. The race limit time is at 15:00. Please assist us to ensure everyone’s safety by de-registering as soon as you have finished the race. De-registration is an important record for us that participants have finished and are safely ashore. The de-registration tent will be located near the top of the Port of Cork Pontoon. Paddlers are strictly required to return the special bibs as they are on loan from the ICU. Post-race showers are available for €5 p.p. at the Clayton Hotel. For full Race Regulations, please check here. With over thirty different types of craft, there are many prize categories in the Ocean to City. The Prize Giving Ceremony will take place after the race at the Clayton Hotel on Lapp’s Quay (time tbc). Prepare for up to 4 hours on the water, with appropriate protection for the elements. Conditions can change on the open water, and protection from both cold, wind and sun is recommended: sunscreen, rain gear, layered clothing, hat/cap, shades, etc. Boat safety requirements include: 20ft towline, two 2l bailers, a clearly displayed race number, mobile phone and an orange flag (in race pack). Spot checks will take place on the day. It is the responsibility of each competing crew to ensure that their craft is seaworthy for the area and the forecast conditions. All boats must present themselves for inspection on race day. Retiral/rescue: participants must report to a Shore Safety Point if they retire; if rescued, participants will not be permitted to continue racing. Rules of racing: participants must go through gates; gates are integral to the course and to safety; overtaking boats must keep clear of boats they are passing; boats being overtaken must hold their course; participants must not wash hang. Participants that do not pass through gates will be automatically disqualified. Detailed rules and regulations can be found here. Meet the Crews! Friday 31 May, 19:00-21:00, Idle Hour Pub, Albert Quay, Cork: Gather with other crews and our host club Naomhóga Chorcaí to get the inside tips on the race, the courses and the harbour. A warm welcome to all our visiting participants! Make it colourful: We’ve generally got over 200 boats taking part and encourage all participants to join the party! Hoist a flag in the stern of your boat, come along in fancy dress or paint your own crew battle-stripes on your face. The more colour the better! Prize Giving Ceremony: Time tbc at the Clayton Hotel, Lapp’s Quay, Cork. After-Party at Idle Hour Pub, Goldbergs and The Sextant, Albert Quay: Unwind after the tough race and celebrate your achievements with a jig, a reel, and a cold drink in hand. Hosted by Naomhóga Chorcaí.